Salma Arastu has been painting for thirty some years. Born into Sindhi and Hindu tradition in India, she later embraced Islam through her marriage. She has traveled extensively and lived in various countries--India, Iran, Kuwait, UK, Germany and finally the US, where she moved in 1987. In her work, she tries to bring together Eastern spirituality and western techniques of painting, learned over the years. Three elements are strong influences in her work: Folk art, miniature art and Arabic calligraphy, all adopted along her journeys. Seeing the unity of an all-encompassing God, she was able to transcend barriers often set forth in the traditions of religion, culture and the cultural perceptions of handicaps--she was born with no fingers on her left hand. Her personal triumphs have been defined and shaped by the simple principle of faith in the divine power, the compelling force which has guided her life and work. As both a Hindu and Muslim woman, a multi-cultural artist, and a mother, she sees unique opportunity in creating harmony and world transformation through the expression of the universe in her art. Well, I cannot deny the influence of Paul Klee, Miro and Picasso from Europe, M.F. Husain and Amrita Shergil from India. I liked the human figure and I admired what these artists had done with them. I wanted to break the traditions and create something new with the figures which would convey my feelings of love, peace, unity, sharing and celebration of life. I have worked hard for several years to achieve this, and I think today I have successfully developed my own interpretation and form. My story begins with a lyrical line and this same lyrical line allows me to design Arabic calligraphy or draw abstract images of crowds of people with same facility. My inspiration is my faith and it keeps me motivated to do more and more. Painting is a way of worship for me. Tell us about your journey? How did you become an artist? Did you receive any formal training? Art is my need; a need to express and reach out. From my childhood days, I felt that I had something important to say and I used to doodle a lot. I have been painting for more than thirty years. I earned my degrees in Fine Arts from the College of Fine Arts and Architecture, Jawaharlal University, Hyderabad in 1971 and later in 1974 from the MS University in Baroda, India. I have traveled extensively--from India to Iran to Kuwait to UK, Germany and to the US. And last year, I moved from Bethlehem, Pennsylvania to the East Bay. I have lived for long periods with amazing people and fascinating communities. Folk art, miniature art and Arabic calligraphy are three strong influences on my art, adopted along my journeys. Describe your style? What medium do you work in? I am creating a body of work of through a continuous, lyrical line to express joy in the universal spirit that unites humanity. This lyrical line has been my guide over the blank surface of the canvas. With years of practice, it has become freer and more energetic. It has allowed me to create calligraphic designs or a flow of humanity with same facility. I want to spread God’s love by bringing all people together with this single line of positive energy. 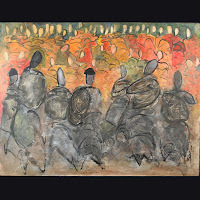 I have created several pieces that show unity and celebration together. In my art, people are not given any identity and thus represent the entirety of humanity without differences. I recreate these visions which show people in celebrations, visiting neighbors, family reunions, celebration of life, glow of unity and hope of the new earth. I am inspired by Arabic calligraphy and Persian and Mughal miniature arts but my work is very contemporary. I mix both the worlds-Eastern spirituality and Western techniques effortlessly and the results are very original and colorful and lyrical. I paint, sculpt and I am also a print maker. My paintings are varied in sizes and range is from 60”/90” to 20”/20” and I work on paper, board or canvas. Technically, my work is evolving, and I keep exploring new materials and mediums to convey my expressions. I often use paper, fiber, molding paste etc. to create textured surfaces on which I paint with thin layers of acrylic paints or glazes. Recently, I have started using copper figures on these textured surfaces which give a unique glow to my compositions. I often add fine details with pen & ink as if embroidering them and thus finally bringing the piece together. What would you consider your biggest success as an artist? 1. I have had more than 40 exhibitions of her work in India, the USA and Europe. 2. Many of my works are in private and public collections --- like the Salar Jung Museum in Hyderabad, the museum of Modern Art, New Delhi, the Harrisburg Art Museum,the Allentown Art Museum and the Pensylvania Power and Light Company. 1. In 2008, the Alameda County commissioned mefor three paintings which are now in the Collection of the County of Alameda. 2. In December 2008, my new book of art and poems in English was published by Half Full Press from Oakland California in their series of Emerging American Artists program. The book is titled The Lyrical Line and has more than 100 images of her works from last 10 years. My paintings celebrate life. In this art book I have tried to trace with lines and color a trajectory of the human emotions that all of us feel no matter where we are from and what our individual situations are. 3. In the summer of 2002, I won a six-week Artist-in-Residence Award. I lived and worked in Swabisch Gumund, in southern Germany where I was hosted by a German family and exhibited my work as a goodwill ambassador for the sister city, Bethlehem, Pennsylvania. 4. I received first place in painting at North Eastern Regional art show at Marywood University, Scranton, Pennsylvania. 5. I have also authored several published works of free verse and short stories in my native Hindi language. My collection of poems, Dard Ki Seedhiyan (Exploring Steps in the realm of Pain) was published in 1981 with a grant from Andhra Pradesh Sahitya Kala (Literary Arts) Academy, Hyderabad, India. 6. Shortly after arriving in the US, I founded Your True Greetings, a successful greeting card company that uses my paintings and calligraphy to serve the needs of Muslim communities in the US, Canada, Japan and the United Kingdom. I am grateful to God as I get very good feedback from my art patrons. They find my work joyful and peaceful. My greatest pleasure is when people find the same message from my paintings that I try to convey. 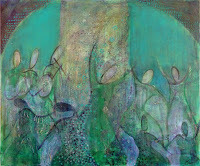 I am attempting to create a world through my art work in which the magic of communion plays a central role. My subjects include people, who do everything together. They initiate each other, they celebrate together, they grieve together, they pray together. In this global world, it is important that we understand each other, accept each other with our differences, and emerge as one human community for the success of humanity.